Artists have discovered the app as a medium. In Germany they can use it to compete for the App Art Awards. It is not always easy there, however, to distinguish among art, interface design and gaming. Black squares with arrows or crosses move across the smartphone screen; players use them to navigate through typographically designed levels full of poetic messages. Philipp Stollenmayer’s app game Sometimes You Die subverts what we know of computer games, aesthetically and structurally: in Sometimes You Die you have an unlimited number of lives. And you are confronted by questions such as: “what makes you accept this game as a game?” In respect to the art form of app art this is in fact a good question. For what here is art, what game, what both, is not always apparent at first glance. In 2015 the German designer Philipp Stollenmayer, born 1993, won an App Art Award in the category of Game Art with Sometimes You Die. The competition, annually organised by the Centre for Art and Media ZKM in Karlsruhe, has established itself as an important platform for the international scene and the fledgling genre. Since its opening in 1989 the ZKM has become a leading institution for media art with its exhibitions, research projects and special features, such as the internationally unique laboratory for antiquated video systems, where specialists restore, digitalize and archive video art. In July 2015 the App Art Award jury awarded the prizes for the fifth time. In addition to Stollenmayer’s app, three others won prizes. In the section Crowd Art one went to Radwende, an app of a german artist that records the path covered by a bicycle and then visualizes it in a museum. The prize for Sound Art went to Borderlands Granular, an electronic music instrument with which the user can manipulate small, visualized sound units by touch. A similar idea from the US multimedia artist Fader, who otherwise creates spectacular projections for events, received the Artistic Innovation Award. With his app EDMT, users can generate with finger motions graphics and sounds. Both app art works and commercial apps are honoured at the App Art Award. To try out apps as a form of artistic expression, in their app ZYX, which won a prize at Karlsruhe, the media artist Joan Heemskerk und Dirk Paesmans, known as Jodi, animate people to sequences of movements and make them participants in a performance. This is quite similarly to works such as One Minute Sculptures by the artist Erwin Wurm, which invite museum visitors to pose with objects. App store – a brake on creativity? An app does not need a museum. Just this is what makes them interesting not only for established artists but also and especially for up-and-coming artists. Nor do app artwork need an art gallery; whoever wants one, downloads it on his device free of charge or for very little money. While many critics object that the fluid boundaries between art and commerce make it difficult to establish a claim of original artistic merit for apps, this is not necessarily a disadvantage for the artist himself – at least not financially. Artists should use the opportunity to earn money with their apps, says Rafaël Rozendaal. The brasilian artist has projected onto gigantic screens in New York’s Times Square and the Amsterdam Stedelijk Museum animations whose elemental colors and flatness are reminiscent of pictures by Henri Matisse or Pop Art artists such as Tom Wesselmann. Often, however, he also designs his digital works as websites. 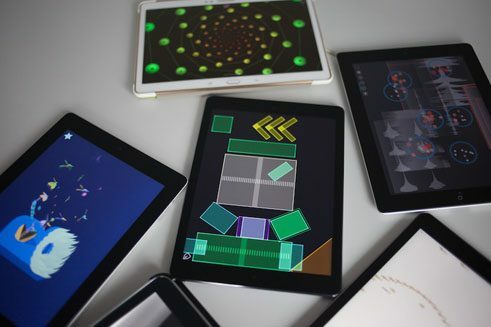 He deliberately plays with the fluid boundaries of art, interface design and gaming, including in his app Finger Battle, which he offers for sale at the price of 99 American cents. It consists of two opposing, growing fields of colour, on which the player taps with his finger until one has ousted the other. Rozendaal has already sold 20,000. Whoever wants to market his app, however, is dependent on the app store. With the operating systems Android (Google) and iOS (Apple) two powerful companies have divided the market between themselves: only apps registered in their stores can be installed on mobile devices. Although the platforms have been monitored, this does not constrain creativity, thinks Peter Weibel, media artist and Director of the ZKM. The freedom for artistic experiment at the Apple Store, he says, is much greater than at a German publishing house or on German television. Among artists creativity is often rather a synonym for the mature treatment of software: they hack it and appropriate it instead of merely using it. For his work iPhone live, the Berlin interface artist Johannes P Osterhoff infiltrated the security structures of Apple to install on his device an app that he himself had developed – jailbreaking in hacker jargon. In this way between June 2012 and June 2013 he published round the clock on his website what he posted on Facebook, what games he played, what music he listened to, what apps he installed and what his friends wrote. And so made tangible the proximity of private and public life in the digital era. App art offers artists new opportunities precisely because it is not necessarily dependent on the distribution mechanisms of the traditional art system, to wit presentation in museums or sales through art galleries. But it does not entirely forego the museum: artists often become established only once their works have become part of collections. But this is not so easy with apps, says Weibel. The ZKM is working on a solution to the problem of archiving app art in the long-term and independent of specific devices – to include also the App Art Awards winners in its collection. The winners of the App Art Awards and a selection of the best entries will be on display at the ZKM Centre for Art and Media Karlsruhe in Karlsruhe until 17 April 2016. In cooperation with the Goethe-Institut, outstanding apps of recent years are on a world tour. After stations in Beijing, Canada, South Korea, China and the United States, the exhibition will visit Cuba, Jamaica and Mexico City. Sabine Weier is a freelance cultural journalist and curator. She lives in Berlin.